Fishing on a pontoon boat is a great experience because it frees fishermen to enjoy the slower moments. 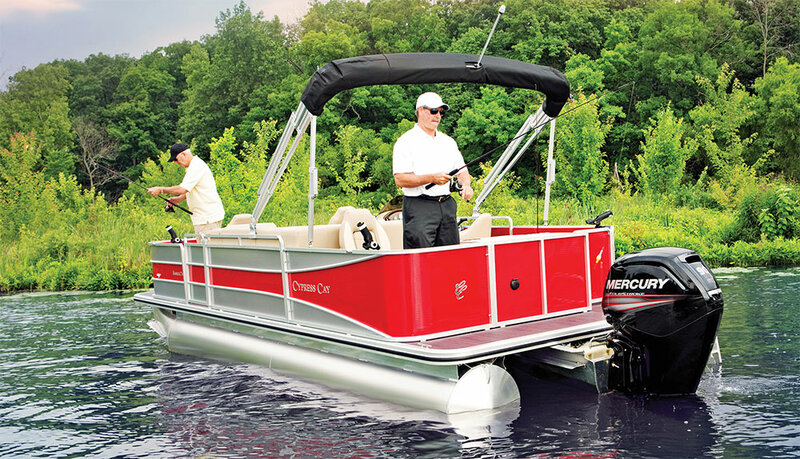 Many anglers and recreational boaters opt for a pontoon boat because of its stability in calm waters, handling in choppier waters, and navigation prospects on almost any waterway. Take it upstream, out on the lake, or into a hidden cove. Below is a round-up of absolute fishing must-haves to maximize the pontoons value in the long run. Weather conditions change quickly in the summer and also vary dramatically from one place to another. By investing in a boat weather station, you can track the patterns wherever you are. One slight deviation in readings can indicate oncoming bad weather. Some systems report conditions over radio frequencies. Configurations include mounted wireless consoles and handheld monitors which keep everyone informed on wind, temperature, humidity, rain patterns and more. Marine GPS systems serve many purposes, making them among the most popular marine accessories. They can be used to mark favorite or productive fishing spots, return to a known location when lost, and help avoid areas identified as hazardous due to debris or currents. Another handy navigational tool, a fish finder plots the location of schools of fish. Lower-cost models offer a simple, yet accurate, plot. Higher-end units feature a more detailed screen, backlighting, and a choice of operating modes, plus sonar history, point tracking, or even built-in GPS. Assuming you have all the essentials to catch good fish, why not be entirely self-sufficient on the water? Pontoon boat grills are designed to fit on deck and remain stable. With some great cooking and a little creative design on board, your pontoon boat can start to resemble your backyard, except you can catch a fish and cook it within minutes. Some boat gas grills can be purchased for a couple hundred dollars, but the possibilities are worth it. Retailers sell a range of different pontoon boat ladders. A hot fishing trip is not the same without a swim or dive. With a ladder, all occupants can easily take a dip and get back on board without help. Otherwise, someone might end up swimming with the fish and be left behind. Not often associated with boats, fenders can offer much protection to the sides and edges of your pontoon boat. Collisions with docks happen unexpectedly. A bump with another boat could be otherwise catastrophic. Inexpensive inflatable fenders should be placed on the front and sides, protecting the boat from any soft collision, and your wallet from pricey replacement parts. The sun can do quite a number on skin during a fishing trip. A shaded pontoon top will make the day more pleasant. It’s great for those who want to stay out of the sun or cool off. There are covers designed for specific boat models and sizes, including bimini tops. A retractable cover is even better because it can be permanently affixed and allow a choice of open or enclosed spaces. Some boats come with seating or choices thereof, or you can select your own to customize the pontoon boat. Flip-top, couch-style, and corner boat seats are among just a few choices. You can also conserve space by installing storage seats, with compartments to keep various items and accessories out of the way. A good seat cover looks good and can withstand the elements. There are specialized materials which can tolerate exposure to the water and sun, adding a unique aesthetic touch all the while. A rechargeable LED spotlight is a handy tool. You never know when a wrong turn before dark, the need for under-the-hood repairs, or camping trip gone awry will warrant the need for extra light. Liven up the day by adding music to the mix. Many sound systems are built just for pontoon boats and include MP3 docks, satellite radio, and other modern amenities. First aid kits come in many forms and should have the standard bandages, gauze pads, antiseptic, compresses, and more. Even a minor scrape can turn a nice day bad. Play it safe by investing in a basic kit – just in case. These easy-to-find additions will make your pontoon boat more functional, productive, entertaining, and safe.